The Chihuahua Club of South Australia is open to all people. As a group, our members have a wealth of knowledge about the Chihuahua and are only too happy to help you with your enquiries. Our official Club magazine the "Chi Chit Chat" is published twice a year and is available to all members. Our objectives and aim is to promote the Chihuahua, educate and encourage new members, breeders and exhibitors, whilst promoting public interest in Chihuahuas and encouraging good fellowship amongst those interested in Chihuahuas. How it all began - Mr Alan and Mrs Peggy Rochford came to Australia from England in 1960 bringing with them seven Chihuahuas. In 1968, Alan & Peggy Rochford placed an advertisement in the local press inviting all who were interested to attend a meeting to see if they could form a Chihuahua Club. 6 February 1968 the first general meeting of the Chihuahua Club of South Australia was held in the Thebarton Community Hall. The meeting was well attended and by the end of the historic night the fledgling Chihuahua Club of SA was formed and office bearers elected. Incorporation (Inc) of the club came later. 27 February 1968 saw the first official committee meeting and was opened by the then President Mr A Rochford with general club business on the agenda. The club was also granted affiliation with the South Australian Canine Council (SACA) that year. 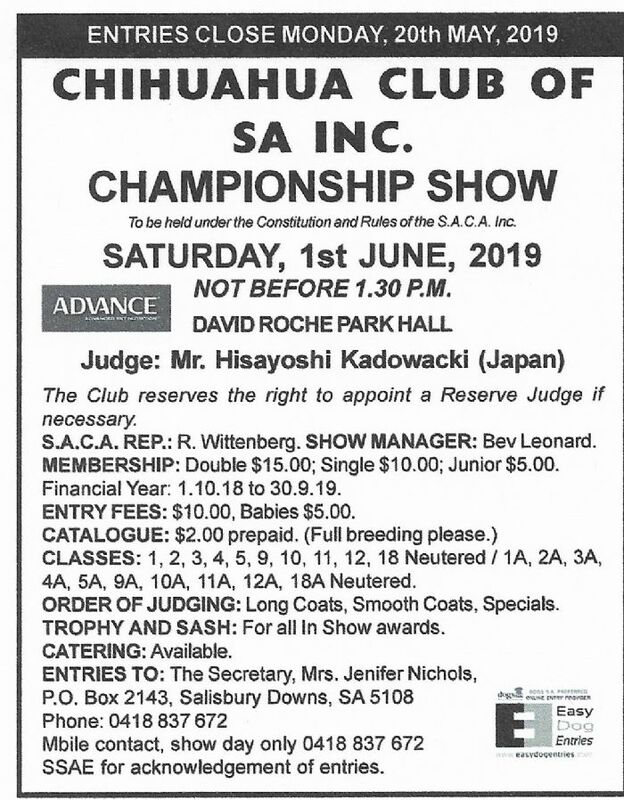 Thirty seven years on from the first historic meeting attended by 24 people who held immense passion for their chosen breed and dedication to form a club - the Chihuahua Club of SA Inc today is as committed and passionate about the well being of the lovable Chihuahua! The Chihuahua Club of SA Inc held the first ever National Chihuahua Championship show in 1998. We invite you to join us at the Chihuahua Club of South Australia. The club is not solely for the benefit of Chihuahua breeders, but anyone who shares in our love of the breed.